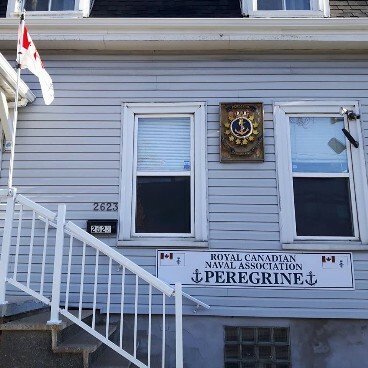 Peregrine is a non-profit organization whose membership consists of but is not restricted to former and current members of all branches of Canada's Armed Forces with an emphasis on the Royal Canadian Navy. Whether it is telling stories about life aboard "The Bonnie", an "O" boat or sharing an experience about a recent deployment to the Gulf or Afghanistan, Peregrine offers a comfortable environment for old and new friends alike to socialize and do just that. You can check our upcoming events to find out what's happening on Friday nights; sit in on a Saturday afternoon "meat" bingo; or just spend a few hours touring the "History of the Royal Canadian Navy" that literally makes up the walls of Peregrine, whatever your speed you'll find something to suit it here.